The objective of biographical writing is to concretize the achievements of a figure considered to have excelled and attained greatness in a chosen endeavour and in life in general, and who is perceived by its author to have affected the cause of humanity. Biographies are often considered to be subjective and sycophantic in nature since its cardinal precept is to patronize, propagate and accentuate the exploits of an accomplished public figure. A literary biography therefore is an artistic reflection of the creative process and growth of a literary subject whose artistic exploits have overriding effect on literary discourses and the society at large. It is a celebration of a life of literary excellence and challenges. Niyi Osundare: A Literary Biography by Sule E. Egya is a grandiose incursion into the life, successes and travails of one of Africa’s accomplished literary legends, the cerebral poet, social crusader and erudite Professor of Stylistics, Niyi Osundare. The book which is divided into ten chapters with various subtitles, three hundred and thirty-four pages and beautifully packaged by the new company, SEVHAGE Publishers through its Whiteline imprint is an x-ray of the story of a rural farm boy from Ikere Ekiti who rose to international acclaim on the dosage of wisdom received on his father’s farm and whose creative texture is drawn from rustic memorabilia of childhood years characterized by his interaction with nature and rural life. The narrator takes the reader on a series of journey into the childhood experiences of the poet’s life, highlighting the significant moments that defined path to glory such as the myth of the Osun River believed according to the story to have been the precursor of existence. The Osun myth is one of the most intriguing points in the book as every positive or negative event in the poet’s life is either directly or indirectly linked to Osun, the river of the river and giver of life. The reader encounters in the book a glowing rendition of the author’s account of the poet’s exceptionally brilliant academic exploits from elementary to secondary schools and at the University of Ibadan. The poet, the author informs graduated with one of the best results at Amoye Grammar School from whence he went on to achieve the same feat at Christ School. However the author is not beclouded by his almost mythical personification of the poet but balances his narration with some occasional realistic reflections of his weaknesses as well, such as in this stance when he posits thus: “From 1964 to 1966, the graduation year, Osundare led the class in all exams, winning eight out of the nine academic prizes plus the General Proficiency Award in 1965. However, his weakest subject was Mathematics, in which he was barely average.”(39) Of course the author also informs that Osundare graduated with a Second Class Upper Degree from UI. He goes on to Osundare’s moral virtues and impeccable character as well as his battles with the various governments that continue to mislead the country. According to the author, Osundare wrote several critical polemics on the affairs of the state, critiquing and proffering solutions on how successive governments could serve the humanistic purposes of bettering the lives of the common man. That he rejected appointment from the federal government and survived threats and even a murder attempt on him which left him in comma. In spite of it all, he remained steadfast to his cause of speaking on behave of the voiceless against a system that cripples its present and future. The most heart rendering and emotionally stirring account in the work is the narration of the Poet’s survival of Hurricane Katrina, an ugly episode in the poet’s life which is likely to induce a tear or two from the emotionally sensitive reader. The rending of this account is intrinsically detailed and creative portrayed in such a way that it comes off as fiction. The story of a renowned global professor and his wife becoming unknown or unidentified persons and denied relief material in the midst of refugees and relying on the alms offered by friends is psychologically traumatizing. This account is found in chapter Eight of the book. 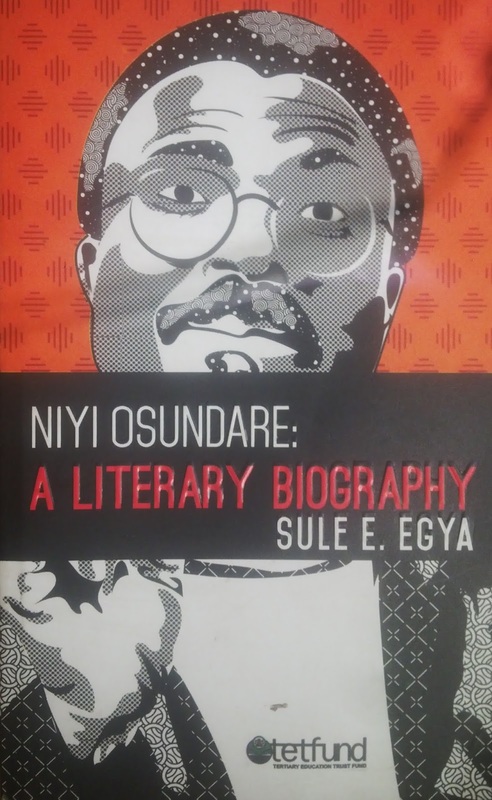 The book also touches on the poet’s writings and the contentions surrounding them, his awards, scholarship and ends by suggesting him as the possible next Nobel Laureate from Nigeria. It is rather an overambitious assertion considering the fact that other equally very distinguished writers and scholars in the Soyinka generation such as J.P Clark, Chinua Achebe and Ngugi Wa Thiong’o are yet to win the Nobel several years after Soyinka. Ngugi has been a consistent contender for the glory of the Nobel Prize, although he is yet to win.